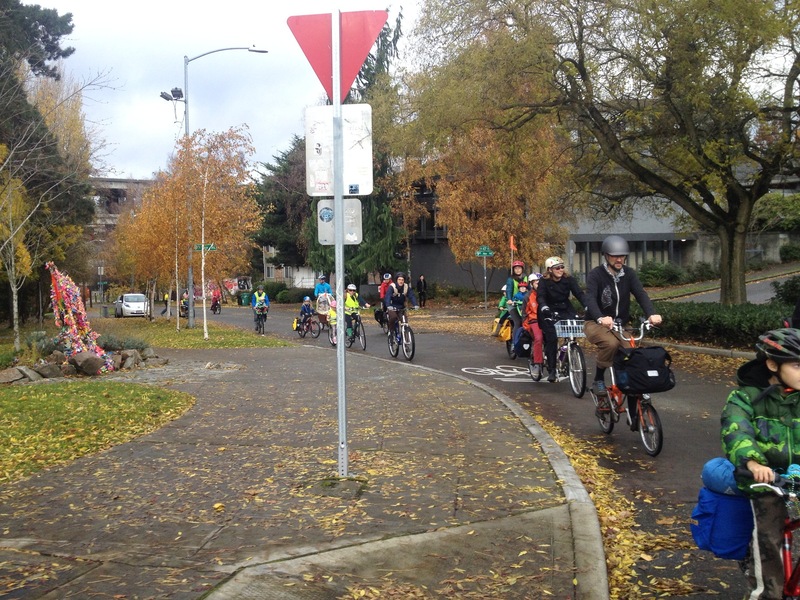 Our Third Annual Thanksgiving Family Group Ride was a huge success! We started with 27 participants and grew to 33 by the end after picking up two families along the way. One family went the other way around the lake, which worked well for finding us, but I’ll be clear to announce CLOCKWISE LOOP next year. See all 122 photos here. 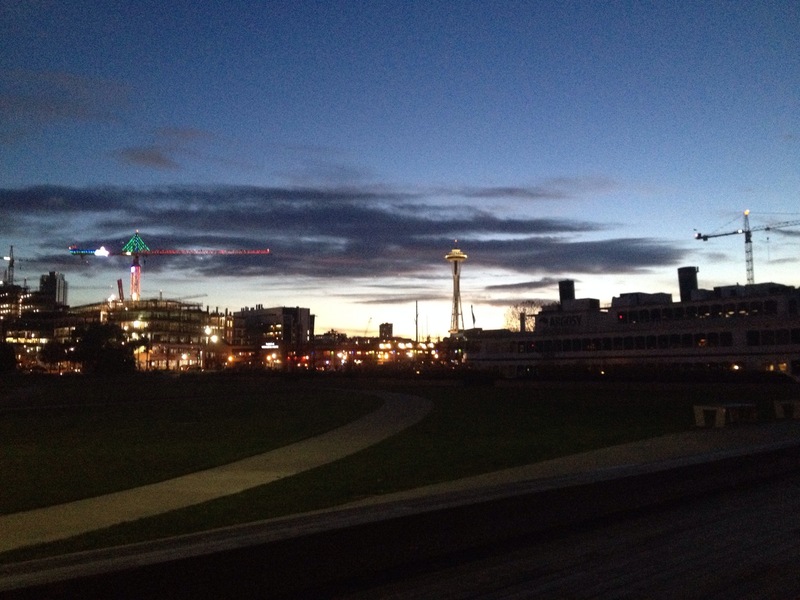 …except the playground stop was more like 11:30 to 12 and we got back to Gas Works Park close to 2pm. Everyone was able to stay with the ride the whole time this year! 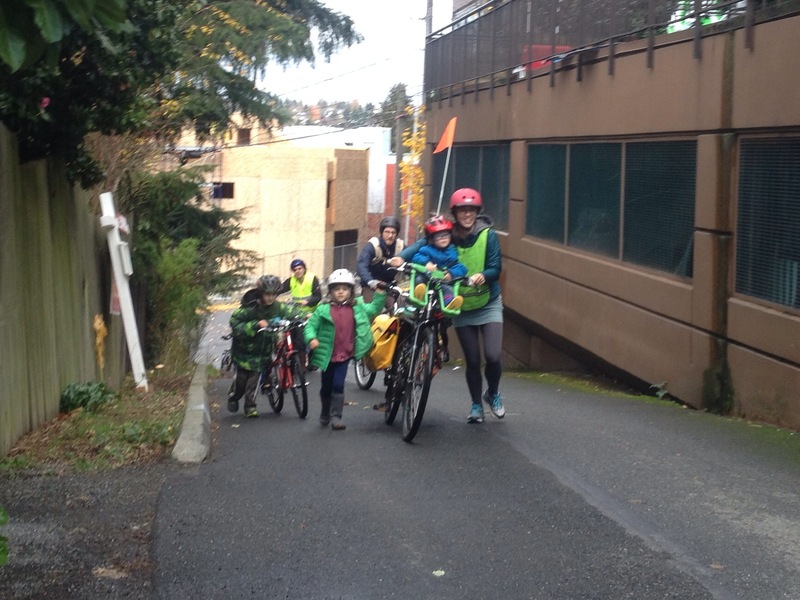 I think it helped to have the timeline so those with cooking and nap obligations stayed away, though on all Kidical Mass rides–and especially this one–families are welcome to drop off early if need be. 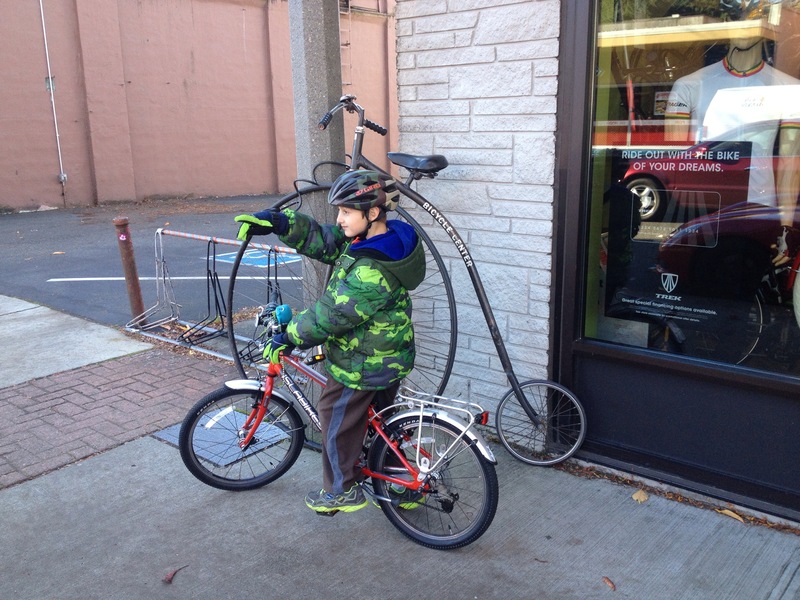 As with all rides in which my five-year old rides his own bike, I had to stop the ride several times. First for a water sip and a bit farther along, as you can see in the picture below, to load him onto my bike because he was too tired to go on. At least it makes for a nice group picture and I feel like it sets an accurate example of how one must sometimes be flexible when biking with kids. I thought we had fun dealing with steep Hamlin and Yale Terrace and mused about naming the hill something fun for next year. Hellacious Hamlin? Tantrum Terrace? But it turned out not to be so popular with everyone so I’ll take a vote about changing the route for next year. 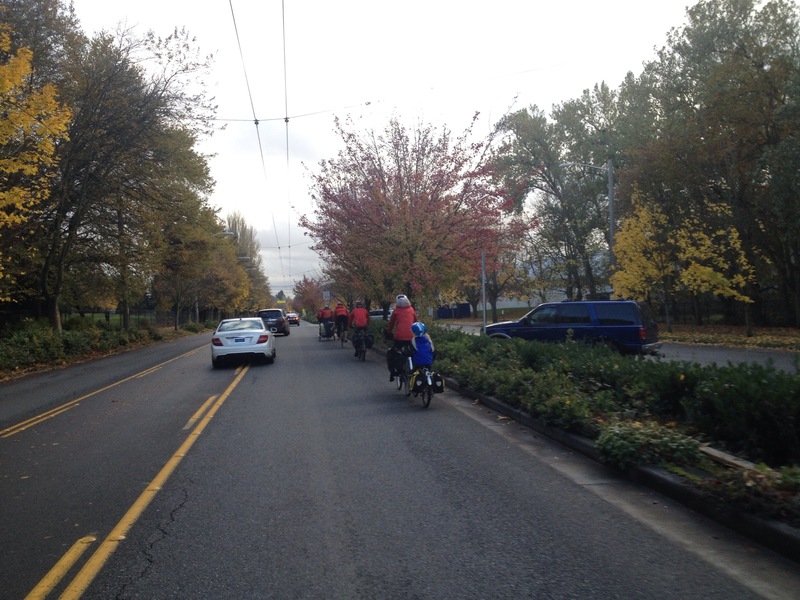 I dislike riding the sidewalk of Eastlake, especially with a big group, but I think we’d need to stay up on Eastlake for three sidewalk blocks were we to avoid the hills. 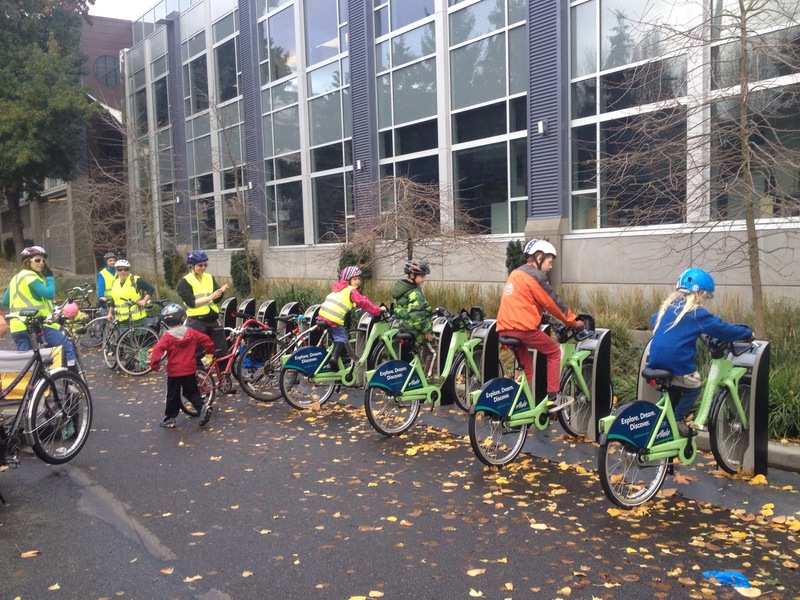 We added a new element to the ride this year–a stop at a Pronto Cycle Share station for the kids to climb on the docked bike share bikes. And shortly after we were at the real playground at Waterway 5. 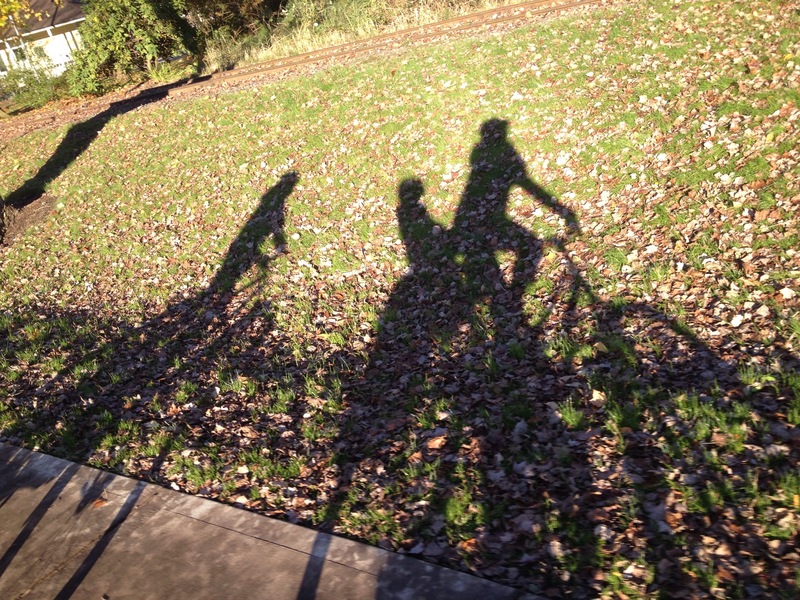 The sun shone on us for a brief minute there–I snapped a picture with shadows! 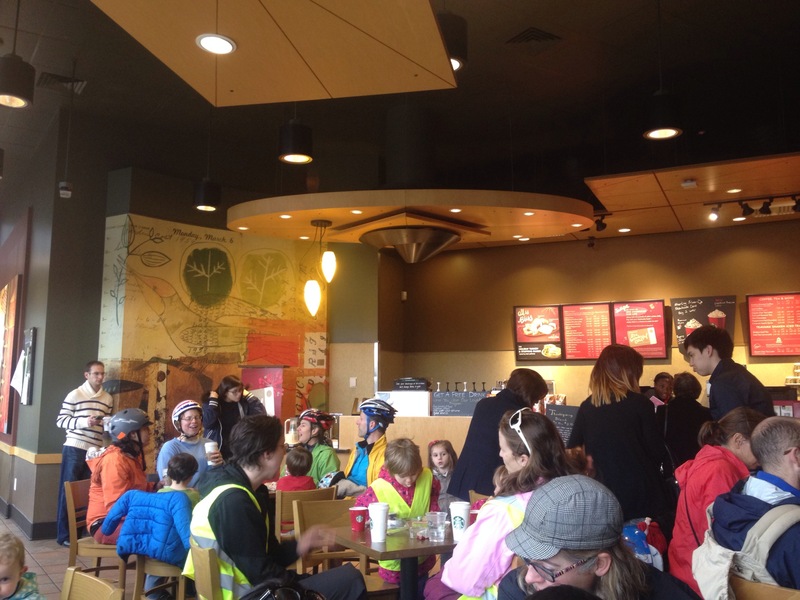 And snacks, restroom break at Starbucks. 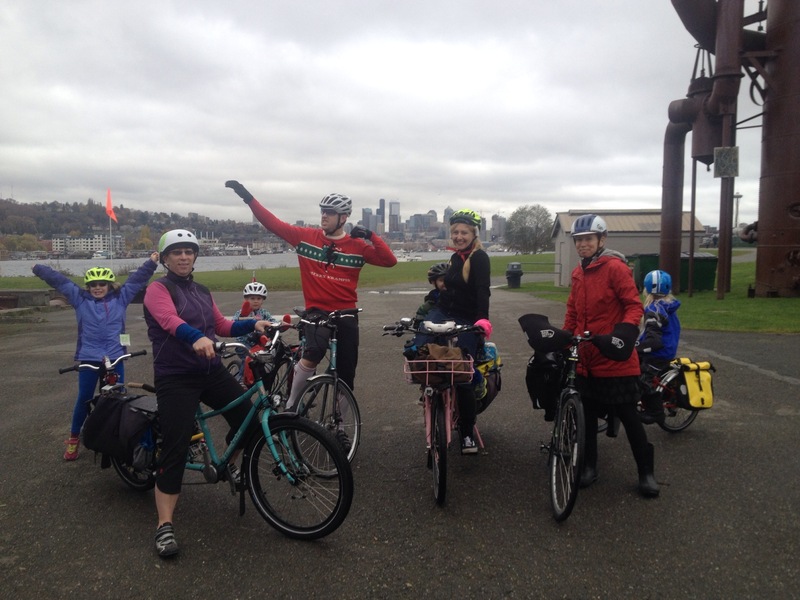 As we approached Gas Works Park at the end of our loop I decided I shouldn’t make everyone cross Northlake Way to enter the park since most of us would be heading one way or the other along the Burke-Gilman Trail. So we pulled into the little area at the Wallingford Steps. It was a bit awkward given the last-minute change of stopping point, but I think I like this for future rides…with advance notice so we can all pull off the trail to take one last group shot and say our goodbyes. And recaps from 2013 and 2012. 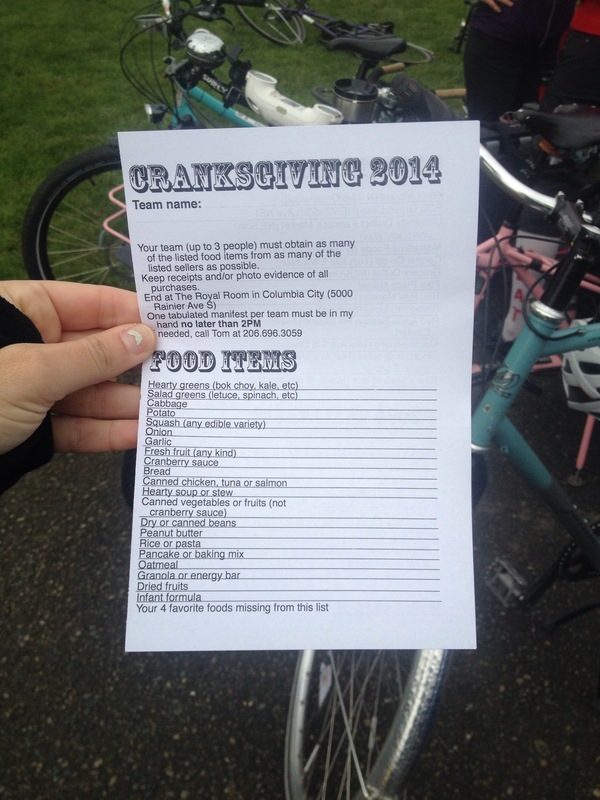 Cranksgiving is a food drive scavenger hunt by bike exploring some of Seattle’s most unique food vendors and grocery stores to gather food for Rainier Valley Food Bank. I took a bunch of pictures over seven hours and 20 miles: Flickr set of all 90 pictures. 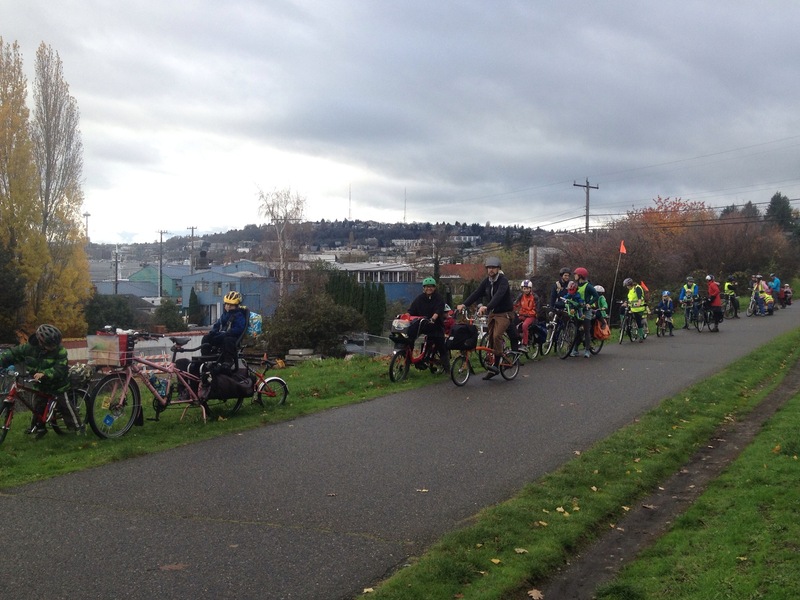 105 riders participated and Seattle Bike Blog is sure to post a recap with more data soon. Participants were allowed to form teams of three. We were nine (but five of them were kids). Alyssa on her Xtracycle EdgeRunner with CycleFab/Haulin’-Colin-attached Burley Piccolo trailer bike and one kid, Dave on his regular bike with trailer bike, me on my Surly Big Dummy with two kids, and Barbara on regular bike with kid bike coupled behind with FollowMe Tandem coupler and one kid. In an effort to finally get to the finish line on time, I created a route map ahead of time and warned friends we’d only hit two grocery stores on the way. I didn’t bring my route instructions with me so we didn’t quite stick to this, but just for future reference and the sake of sharing, here’s my flat-as-possible route from Gas Works to Rainier Valley via Capitol Hill and Beacon Hill because we really didn’t want to ride Lake Washington Boulevard again after last year’s many brushes with people driving too close for comfort. And were were ten minutes late anyway! But we had tons of fun and I did all the photo challenges, which was a blast. Even without my carefully curated directions, we avoided busy streets until Beacon Avenue South after playing on the zip line in Jefferson Park–and this part of Beacon was on my route anyway. However, everyone passed cautiously. So refreshing and not at all like Lake Washington Boulevard last year. 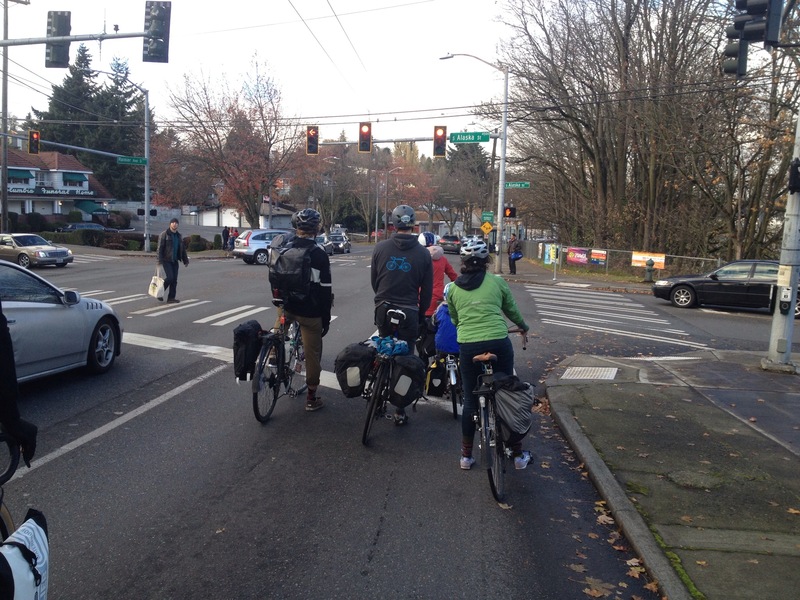 Something new for me this year is I rode in Rainier Avenue for the first time. No sidewalk, all street. 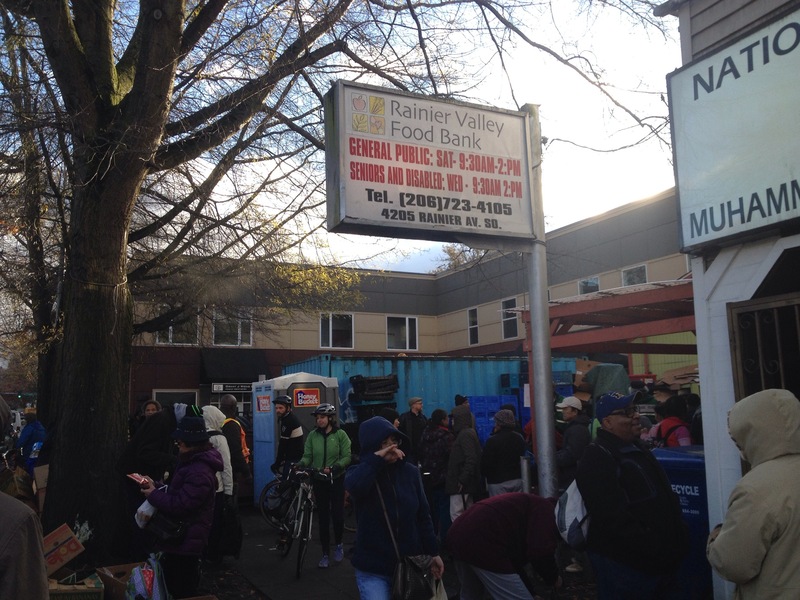 Just 3/4 of a mile from turning in our manifest at the Royal Room to the Rainier Valley Food Bank and then back again. But only because I happened to be heading over at the same time as a bunch of Point 83 bike club members so I felt safe in the pack. The food bank was hopping. I went for a few heavy items (turkey, big spaghetti squash, two big bags of rice) rather than a lot of little things, but next year we’ll go for bulk and variety to better utilize having a cargo bike. The after party in the Royal Room was great. 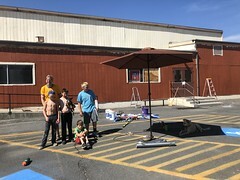 The kids thawed out and ate while prizes were distributed. My seven-year old wore his Halloween Blue Angels costume and got the loudest applause in the costume contest which was incredibly exciting for him. Everyone else in costume chose prizes, too, because there were a lot of prizes to go around! 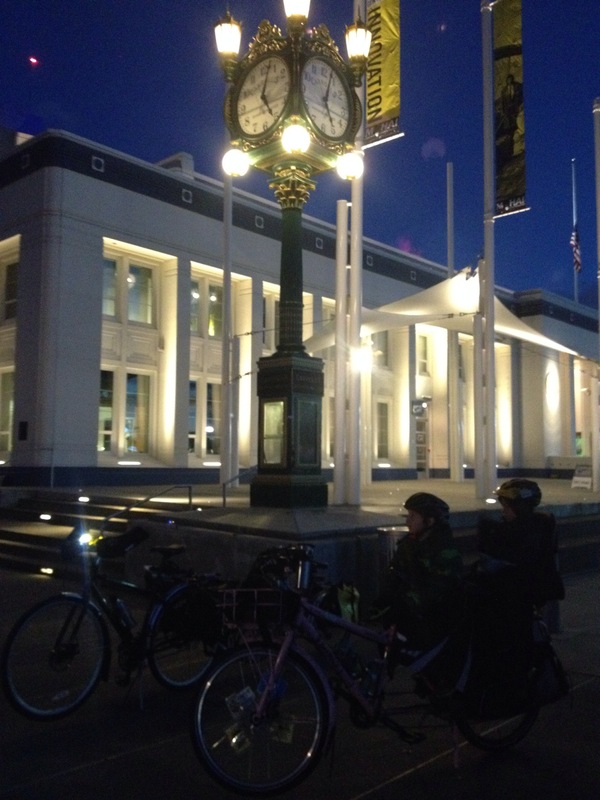 Alyssa and Dave rode the whole way home, but Barbara and I opted to take the light rail. 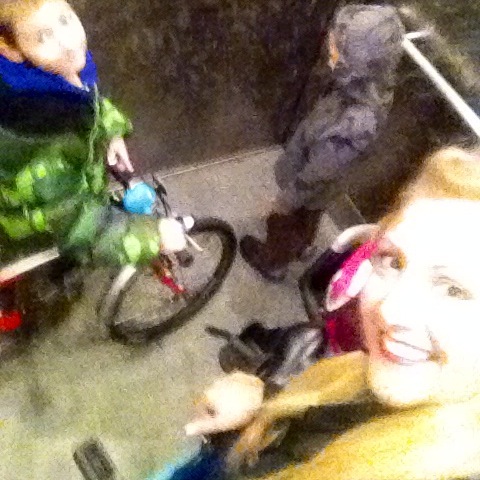 We managed to fit all three bikes and five people in the upper Westlake Station elevator. I don’t think much more could be crammed in there, but it’s tempting to try. In addition to the missing map, I didn’t get our clothing quite right. 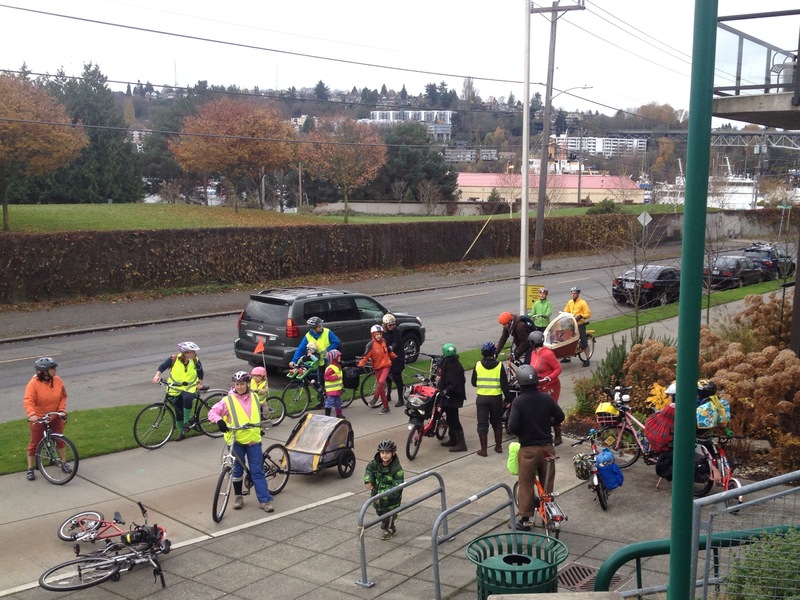 This is our fourth Cranksgiving (and Seattle’s fifth) so I should know this by now, but I let the kids wear regular shoes instead of snow boots. So I draped my old rain jacket like an apron over my seven-year old’s legs and feet and my new rain jacket over the five-year old’s. It almost did the trick. 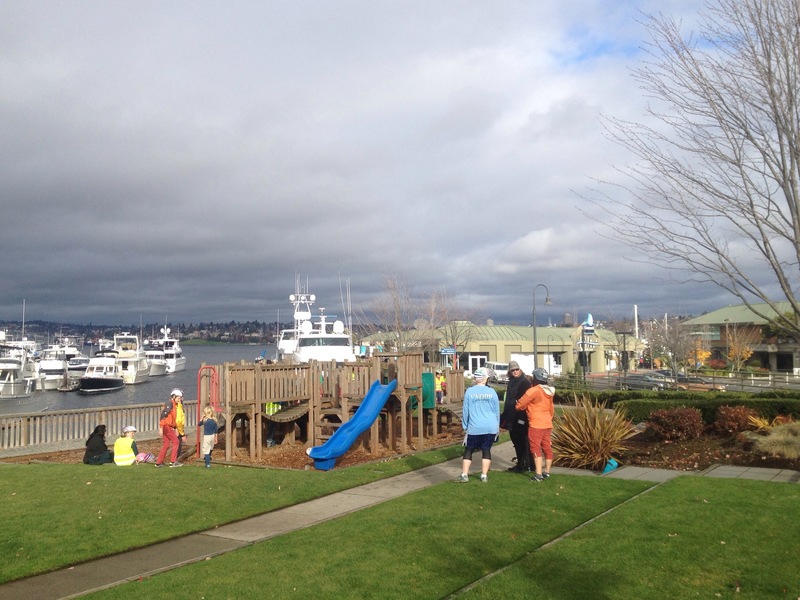 It didnt’ occur to me until we got to South Lake Union that I should put my rain spat shoe covers over my five-year old’s feet because even having borrowed a pair of wool socks from Barbara, his toes were still cold. Anything that works well for rain will work well for warmth, but I often forget that. So we stopped by MOHAI for that one extra layer. And took a moment to appreciate the view. This is at about 5:15 p.m.–already dark! It’s that time again! 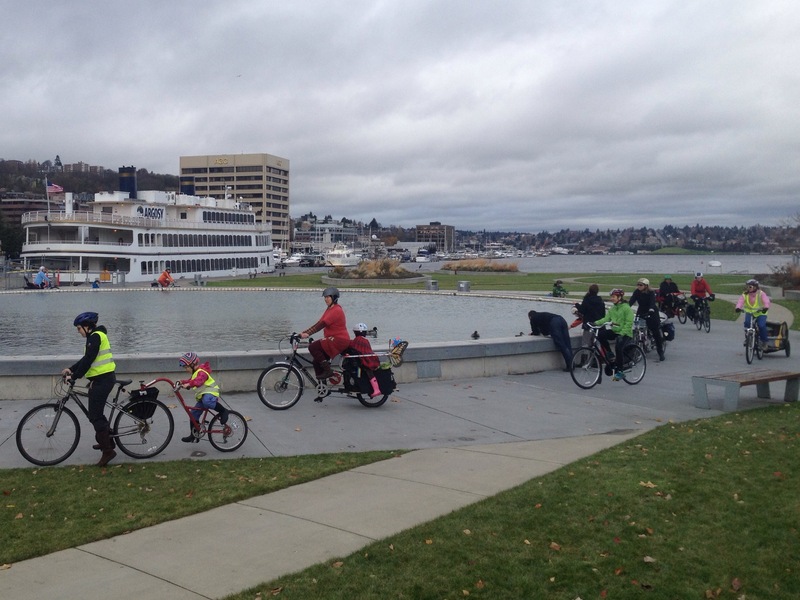 Seattle’s Third Annual Thanksgiving Family Group Ride is coming up next week. On Facebook? You can RSVP here. As always, families are welcome to drop off early for naps and Thanksgiving- and cooking plans. We’re usually a much smaller group by the end. Recaps from last year and the year before. 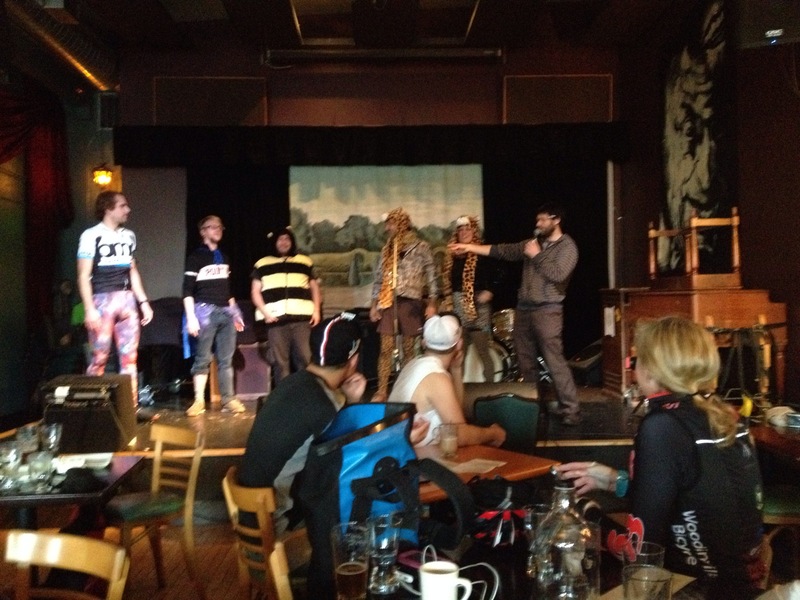 Note: I’m putting this on the Cascade Bicycle Club calendar this year for the first time so there will be the waiver to sign and exciting safety spiel at the beginning. 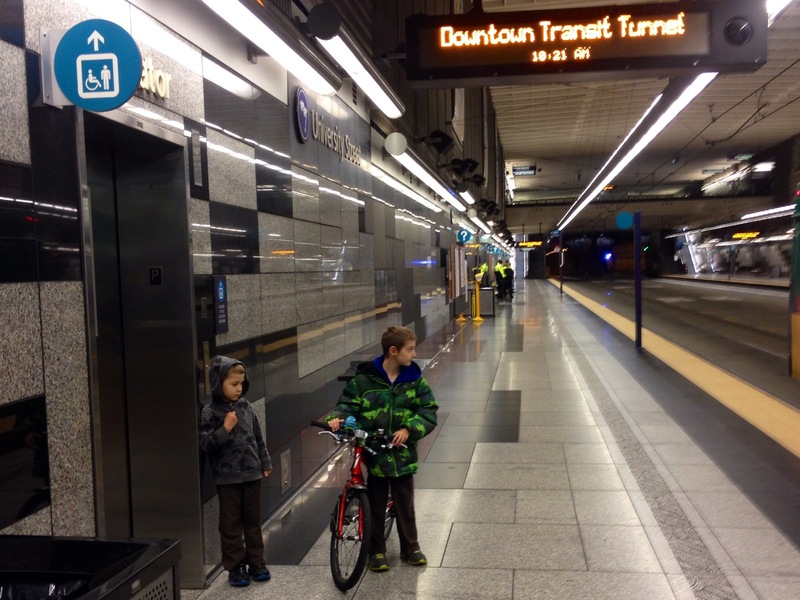 Last of the multimodal trips? I miss the good old days of three on a bike. I’ve pretty much given up on my quest to carry two bigger kids on a regular bike so our monthly (or more often) trips to our orthodontist 20 miles away have meant using two bikes: five-year old in the Bobike Maxi rear seat on my Bianchi Milano city bike and the seven-year old on his own bike. I like the bus OK, but we don’t use it often enough that I’m adept at it. 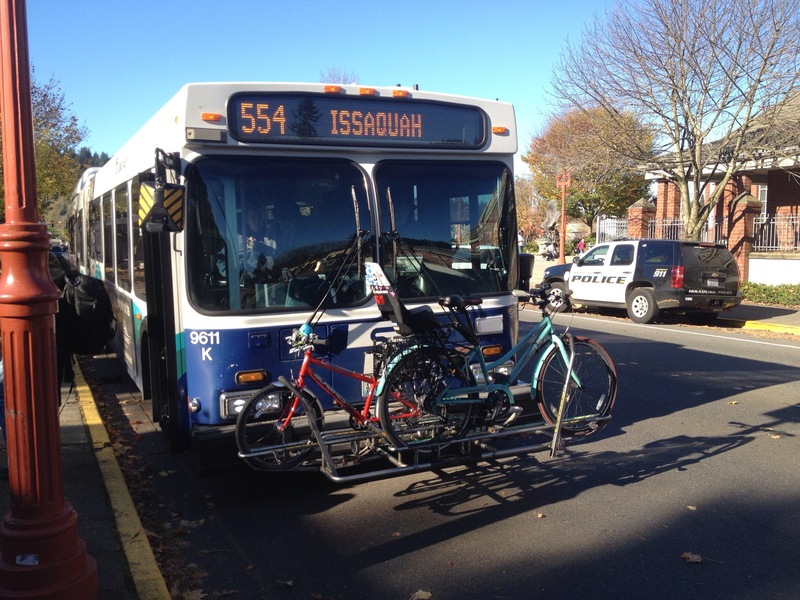 I have yet to embrace the idea of transferring between buses as a good way to get around, so when we were all on the one bike I’d take us downtown and just ride the 554 to Issaquah. 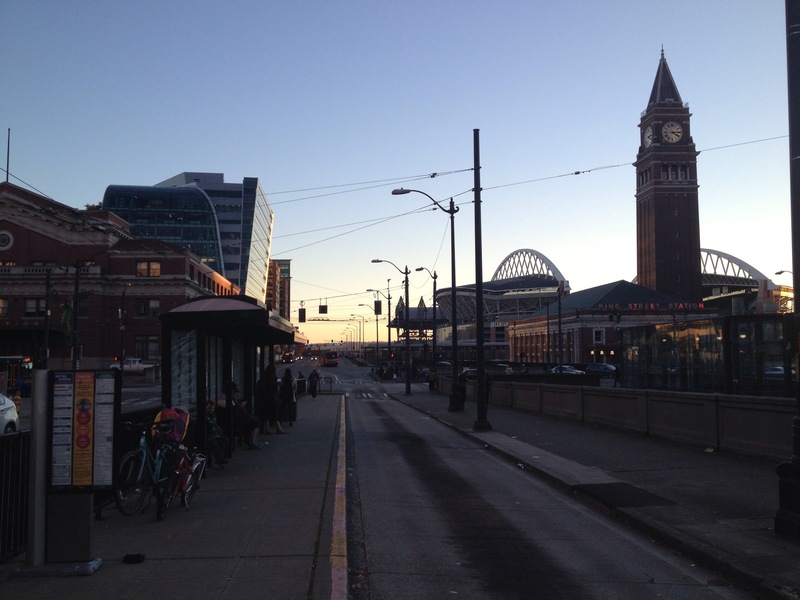 I don’t consider Seattle’s downtown streets friendly enough for my seven-year old to ride on his own so we catch a bus somewhat near home and transfer to the 554. Our varying appointment times and my inability to memorize a good bus combination means it’s a little different each time. Today we started with a 0.4-mile ride to catch the 73 Express which was a first so I didn’t realize we’d be getting off in the transit tunnel. But we fit fine in both of the elevators to get up to street level. 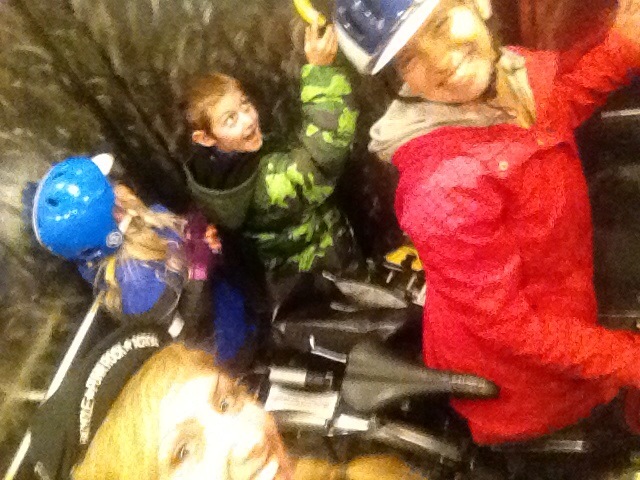 I knew we would, having shared an elevator with Julian of Totcycle, his Xtracycle, and his two kids two years ago. Look at all that room! I could fit 20 camera-shy five-year olds in there! 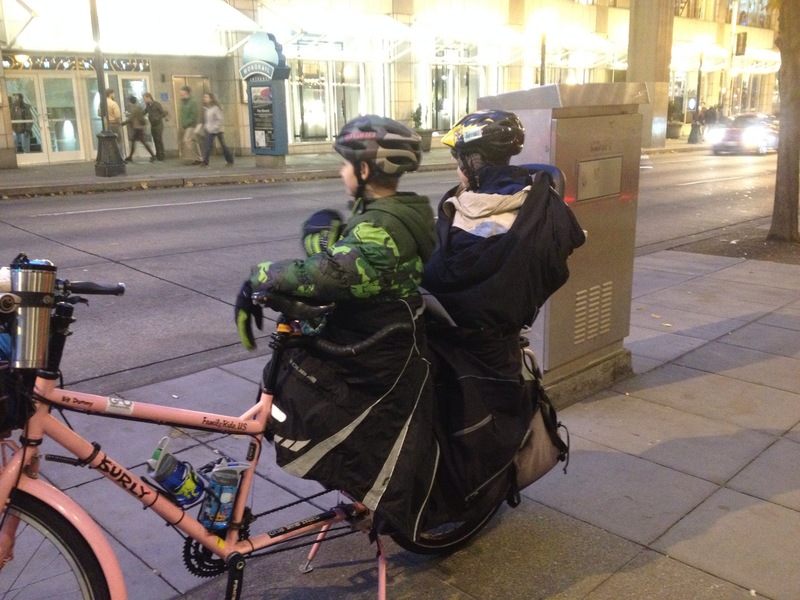 But while we rode the elevator and walked our bikes one block down the steep hill for the second bus, I wondered if things would have been easier without the bikes. Back when legs were littler, walking 0.4 miles to the bus stop would have been a hassle, but we can totally do that now! Of course I have absolutely no idea how long that would take. Please tell me if you have any idea how long walking specific distances with a five-year old takes. Factoring in sibling tussles on a once-per-block basis. A bike-free trip might require one more bus: the free 200 to bring us 1.5 miles from the Issaquah Transit Center to our dentist. Or maybe we could walk 0.8 miles from the downtown Issaquah stop. As I locked our bikes together on the walkway outside the dentist (there’s no bike rack in the whole strip mall), I thought this was also something I wouldn’t miss if we left the bikes behind. 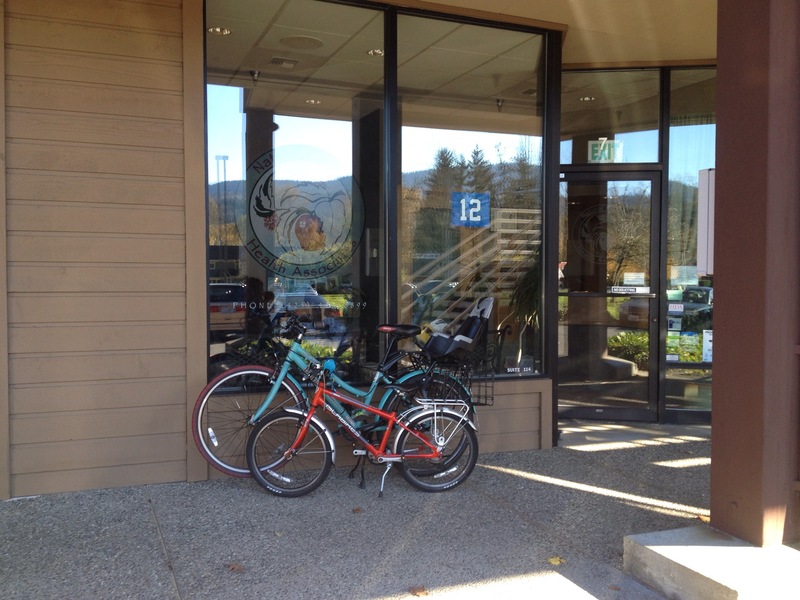 Normally our bike route doesn’t take us along Front Street since the streets are a bit too busy for a kid on a bike and the sidewalks are narrow so I don’t like taking up space on the bikes…so popping into Bicycle Center of Issaquah would be better served by visiting on foot. But our friend Kent Peterson wasn’t in and Dillon the little dog was off camping (poor Dillon! He must be freezing!) so we just banged on a couple floor-model bikes and posed by the penny farthing outside. As we finished lunch at the Issaquah Brewery, which is conveniently close to the downtown bus stop, I realized my five-year old had left his elephant stuffed animal at the dentist, 0.9 miles away. Thank goodness for the bikes! 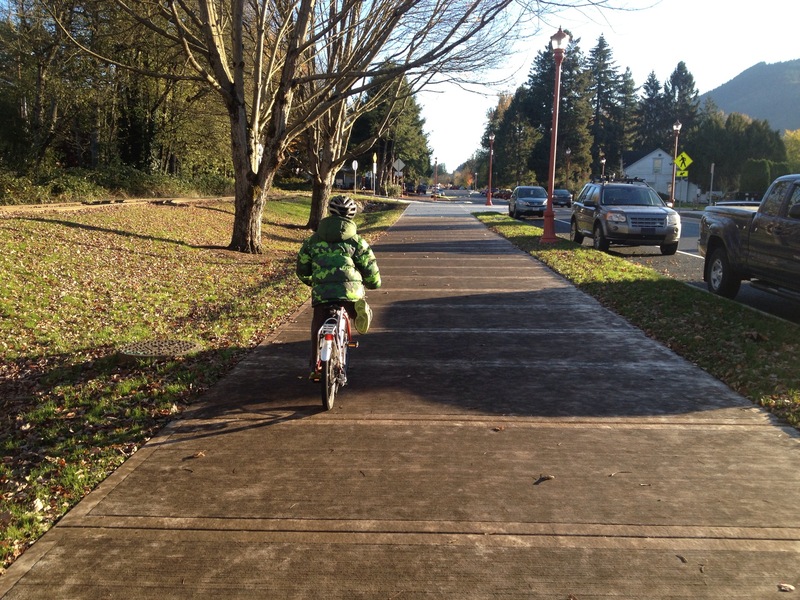 The Issaquah Trail system features wider-than-normal sidewalks that allowed us to ride most of the way on trails…just 115 feet of Gilman Avenue on the sidewalk rather than bike lane on super-busy street. Rainier Boulevard just reopened from a long repaving (or something) project so it wasn’t this pleasant our last handful of visits. Here’s a better picture of the wide “trail” sidewalk. With a bit of bike dancing, note the foot in the air. Great sunlight and shadows today, by the way! 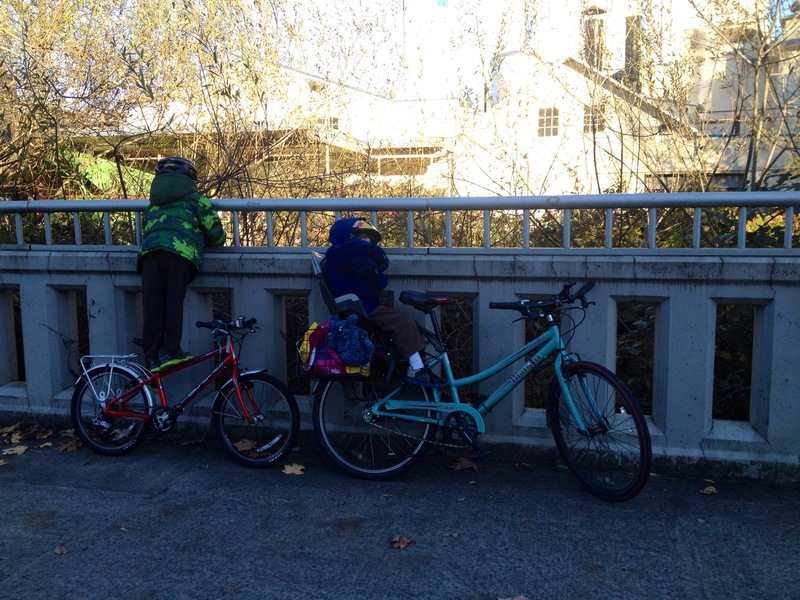 The bikes also made it easier to watch the salmon in the Issaquah Creek. I didn’t see any, but the kids claim they did. We stopped by the fish hatchery next to the brewery (walking our bikes) to check in on the baby salmon so luckily my day wasn’t salmon-free. Coming home we only had a block and a half between buses so we walked our bikes again. I should have chosen a better connection in the transit tunnel, but it just seemed too complicated with the bikes (I choose bus connections the night before an appointment and don’t like changing things on the fly unless forced to), so we had a nice long wait for the 26 that takes us just two blocks from home. 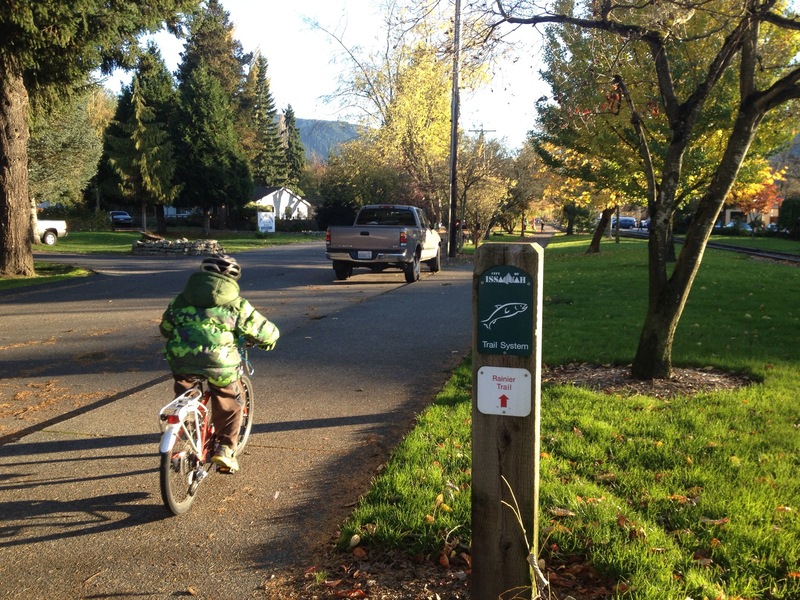 The five-year old and I walked, the seven-year old rode his bike those two blocks. So I’m not sure what we’ll do next time, but I’ve got six weeks to figure it out. However, I do know that for my next cleaning in a couple months, I’ll go alone while the kids are in school and ride my bike the whole way. I can’t wait! And I can guarantee neither visit will include stuffed animal tag-alongs.